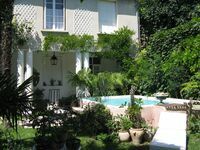 Properties in Vaison-la-Romaine average 4.7 out of 5 stars. Medieval charm and soaring vistas in the heart of Provence: what's not to love? Property 1: Medieval charm and soaring vistas in the heart of Provence: what's not to love? La PROVENCETTE, WELLNESS house 2 steps from the center of Vaison La Romaine! Property 9: La PROVENCETTE, WELLNESS house 2 steps from the center of Vaison La Romaine! Pool and nature, very close to the center! Property 10: Pool and nature, very close to the center! House with its own pool between vaison and nyons. Property 19: House with its own pool between vaison and nyons. Superb spacious apartment with garage and guest parking.Spectacular views . Property 30: Superb spacious apartment with garage and guest parking.Spectacular views . pretty detached house, view Ventoux, private pool, garage. Property 40: pretty detached house, view Ventoux, private pool, garage. Exceptional architect house, panoramic view! Property 43: Exceptional architect house, panoramic view! Romantic town-house in centre of Vaison-la-romaine with 22 sqm outside terrace! Property 47: Romantic town-house in centre of Vaison-la-romaine with 22 sqm outside terrace! We were able to park our car for free and walk wherever we wanted to go. Short walk to shops and square. Easy walk to Roman ruins and upper town. Rooms were comfortable and kitchen was very well equipped. It was cold when we were there and we had to rely on electric heaters in each room and keeping doors closed. The hallways were quite cold. Still, we found it a great place to stay, and the hosts were very helpful. We rented this house in July of 2018 and loved it...we were very sad to leave, and thought &quot;until next year.&quot; As a result of some weird business travel plan changes, we were &quot;stuck&quot; in France for a week, and had to stay somewhere. As luck would have it, our favourite house was available, so we booked immediately. We had a perfect seven nights. If anything, it was even better than our stay earlier in the summer. Some nights were too cool to eat on the third floor terrace, so we had our first dinners in the main room, and loved them just as much as our rooftop dinners. Check in and check out were flawless as before, and we are even meeting some of the neighbours, all of whom wave and chat and are most friendly.